Hailing from Chino, Calif., Jeremy Belanger nearly used a half a tank of gas on his sojourn to Los Angeles to become a writer and director. 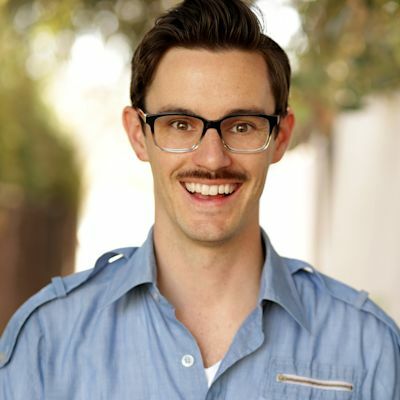 Jeremy studied screenwriting at Chapman University, though he wished he studied bio writing.Jeremy can be seen live every Friday night on his couch, eating cheese. Hoda Kotb’s worst nightmare came to life on “Today.” “Saturday Night Live” cast member Kenan Thompson did an impression of her on live TV. On "Megyn Kelly Today," Kelly was asked if the accusations against former Fox News host and chair of the Miss America pageant were believable. Celebrities share their embarrassing #ShareYourRejections stories on Twitter and reveal that with fame comes a ton of rejection. Milo Ventimiglia visited 'Today' and surprised 'This Is Us' fans by sneaking up on them while they gushed about the show. Ruby Rose fought back tears as she recalled her reaction to being cast in "Batwoman," the first show to focus on an LGBT superhero. Spike Lee had a good laugh hearing David Duke was concerned with his portrayal in the film "BlacKkKlansman." Barbara Eden responded to criticism that "I Dream of Jeannie" wouldn't fare well after the emergence of the #MeToo movement. Omari Hardwick said in an interview on "The View" that he's had several incidents with police as a black man, one in which he had seven guns drawn on him. An entire category on Thursday's "Jeopardy" was dedicated to "Wonder Woman" star Gal Gadot. Former White House press secretary Sean Spicer was grilled by Megyn Kelly on his claims of inauguration crowd size and other falsehoods by the White House. A 25-foot shirtless Jeff Goldblum statue appeared in a London park to celebrate the 25th anniversary of "Jurassic Park." Runner Ida Keeling, 103, received an honorary ESPY Award during an interview on "The View." Mike Colter, star of "Luke Cage," visited "The Talk" and said that his daughter swallowed part of his action figure and he dedicated himself to finding it. The Season 2 finale of "The Handmaid's Tale" left us shocked and wondering about the answers to these seven questions. Kathie Lee Gifford returned to "Today" and shared an embarrassing story about a wardrobe malfunction when she was only wearing a robe. The YouTuber visited "Live With Kelly and Ryan" for her first TV interview since her viral video announcing her pregnancy to the world. Curtis "50 Cent" Jackson explained just how he ended up performing on stage next to a dancing John Travolta. "Brooklyn 99" star Terry Crews gave an emotional testimony during a Senate hearing for the Sexual Assault Survivors Bill of Rights.